We’d love your help. Let us know what’s wrong with this preview of Fire Starters by Jen Storm. Fire Starters is one book in The Debwe Seri Looking for a little mischief after discovering an old flare gun, Ron and Ben find themselves in trouble when the local gas bar on Agamiing Reserve goes up in flames, and they are wrongly accused of arson by the sheriff’s son. As the investigation goes forward, community attitudes are revealed, and the truth slowly comes to light. To ask other readers questions about Fire Starters, please sign up. “Fire Starters” is an excellent book for middle graders about the prejudice facing indigenous peoples. It’s also a morality tale about taking responsibility for your actions. Tough subject matter to read, as it should be. The artwork is great. Fire Starters is essentially a slice of life showcasing intercultural relations between a fictional reserve and the small town it resides beside. When a local gas bar goes up in flames, two aboriginal teens are suspect by the police and blamed by the public because they were seen earlier with a flare gun in hand. Parental Note: Tobacco use is used for both the expected personal use as well as for more traditional offerings. Religious symbols are also seen throughout, but it's not a religious sto Fire Starters is essentially a slice of life showcasing intercultural relations between a fictional reserve and the small town it resides beside. When a local gas bar goes up in flames, two aboriginal teens are suspect by the police and blamed by the public because they were seen earlier with a flare gun in hand. Parental Note: Tobacco use is used for both the expected personal use as well as for more traditional offerings. Religious symbols are also seen throughout, but it's not a religious story. What I really liked about the story was the art and the subtlety. You can tell we're somewhere in Manitoba, and besides all the Winnipeg Jets iconography, you can see other current pop culture references in the background. Though perhaps I could complain that the teens all look perhaps a bit older than they should (Michael is the only one who looks a little babyfaced) our cast of snowflakes all have distinctive looks - even one of the boys has a slightly heavier-set look. That isn't to say that the artwork is super detailed or stylized, but you notice design differences on the principle characters. You also see a lot of small details that, if you are unaware of the situation, you might not notice - such as references to a missing aboriginal girl, as well as the apparent Canadian addiction to all things HOCKEY. Where I get persnickity is some of the story and the treatment of police officers. This story is built around teenagers, and it's not big enough to address everything it touches. For instance, the main characters of Ben and Ron don't really get that much development as compared to their grandmother and the actual culprits, Mike and Jason. This is actually fine, because the real drama and development needs to come from people who need to examine what they did and change, because, short of doing pretty much what 90% of teenage boys would probably do with a flare gun, didn't do anything wrong, but in a way it just highlights that they're victims in a system designed to work against them. This doesn't really make them heroes so much as placeholders for a conversation. Fine for us grown-ups, but for the target audience, I would have preferred more of a lens through someone I'm supposed to associate with. Now, the cop convo comes from a place as a first responder, so my grain of salt comes from regularly associating with the RCMP and DOPS. Michael is the sheriff's son, and has zero problem letting Ben and Ron take the blame because he figures that they're destined for jail anyway. The sheriff comes across as rough and angry, and it's pretty blatant from Grandma's mouth that he has it out for the boys because of racism. He does do the right thing eventually (a blink and miss it he's in the healing circle near the end) but my only problem with this as a teaching tool is that I don't want a conversation that assumes cops are naturally prone to hate a particular group. I'll be the first to acknowledge that there are problems with individuals and institutions need to be held to task, but I don't like narratives that support condemning a group as a whole. It's a story that feels like an 'Fire Starters' by Jen Storm with art by Scott Henderson tells a good moral fable for younger readers. It works well in a graphic novel form. Fire Starters has an interesting story, which feels tragically believable. It addresses racism, white privilege, etc. Despite its heavy topic, it has a relatively happy ending. It's worth the read. I liked the art (and for those who have seen my previous reviews of work by Scott B. Henderson, yes I liked it better with colour), which I thought suited the story. I will happily read anything else from Jen Storm if she puts out anything else. I definitely plan to continue reading books fro 3.5 stars. A touching story of family and prejudice being corrected. A very hopeful take on a very real problem. I love how empowered and unique each woman in the story was. I loved the mother with big arm muscles, as that isn't a physique you see very often in comics. I also liked that one of the main character was a little chubby, as that is also rare in comics. I look forward to checking out more books in this series. My experience with Highwater Press is that they consistently publish great indigenous graphic novels and literature. 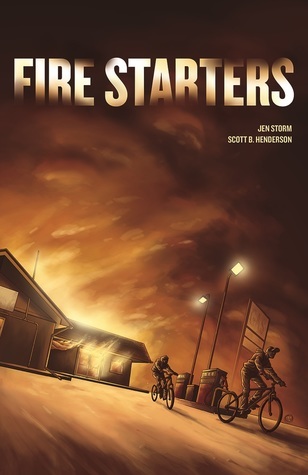 In this case, Jen Storm’s Firestarter is expertly illustrated by Scott B Henderson. The story and the art merge into a well crafted tale of the struggle many indigenous youth face with racism as they manoeuvre through the justice system. I know not all police are racist but in this story the officers are quick to point to finger at the 2 native youth in question. Added to this is My experience with Highwater Press is that they consistently publish great indigenous graphic novels and literature. In this case, Jen Storm’s Firestarter is expertly illustrated by Scott B Henderson. The story and the art merge into a well crafted tale of the struggle many indigenous youth face with racism as they manoeuvre through the justice system. I know not all police are racist but in this story the officers are quick to point to finger at the 2 native youth in question. Added to this is a gruesome fight at the off reserve highschool and some racially charged name calling. A very quick read with a simple but powerful story. The plot--two Native boys are accused of starting a fire because they were earlier seen with a flare gun--does a beautiful job of illustrating prejudice and injustice without coming across as too didactic. Because of the brevity of the graphic novel, the characters aren't very well developed, giving the story a fable-like quality. This should be an easy sell to my library's graphic novel fans. For every white person who grew up near reserve - read this breathtakingly beautiful graphic novel. Remember that no matter where you grew up, it’s near reserve. Be prepared to swallow some hard truths, and be prepared to see what reconciliation can look like. Remember that reconciliation takes white people in positions of power surrendering that power to indigenous leaders. Love that it features indigenous characters and is written by a native author; wish that it were longer and that it included more exposition and character development. Also, the artwork was well done, but I think the high-school-aged characters looked like they were way older than they were supposed to for some reason. This was an easy read - a really approachable format for talking about Racism and prejudice. I think the lesson about reconciliation is an important theme. I'm going to make my 13 year old son read this to return it to the library. Two Ojibwa boys who happen upon a flare gun in their garage took the opportunity to play with it. However, they were subsequently blamed for setting fire to a gas bar station. They have to clear their name when the local police come looking for them. Heavy issues addressed... quickly. I would have liked to see more resolution. The ending comes disappointingly fast. A fine story about responsibility when a friend is a fuckup. Very didactic, but the high stakes could appeal to kids in grades 5+. better than reading Highlights at the dentist waiting room. An authentic look into small town Canada. Now we have a dynamic trio! Author Jen Storm teams up with the amazing illustrator Scott B. Henderson and colour artist Donovan Yaciuk. First, I’d like to note that this is not a middle-grade read but more intended for the young adult group of readers. The artwork is fantastic and greatly compliments Storm’s story. Now to the content. I found that toward the end, as the conflict and tension continued to build, I was ready for an explosion. Sadly, that didn’t happen. Between the last few pages, it felt like something was missing. Now, don’t get me wrong, the story is still good, I just wish there was more from the time the Sheriff found out the truth about his son, the results or consequences of his son lying and how it affected everyone. More was needed to include the rising emotional turmoil which I’m sure would have been there under the circumstances. I believe the story would have transitioned better in the end, if more was included.